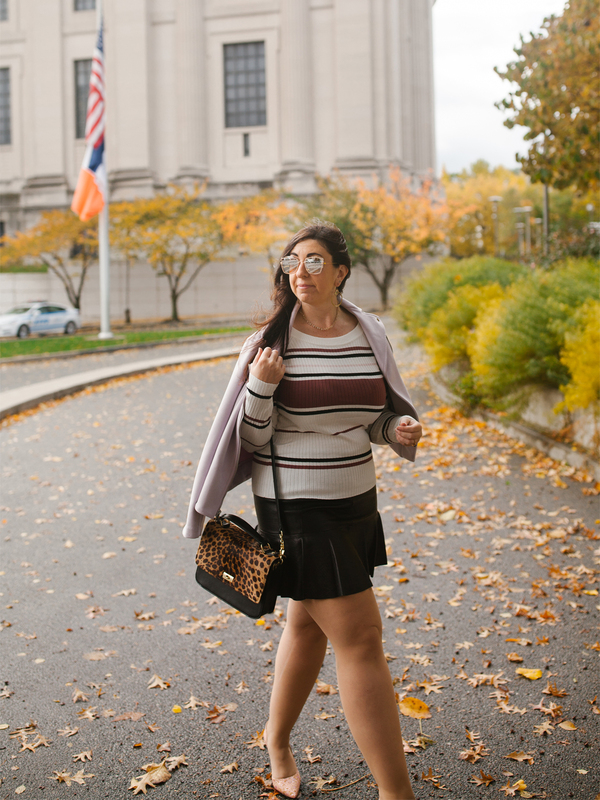 This outfit post about the perfection of the striped sweater for Fall and Winter contains affiliate links. Please read this blog’s disclosure post for more info. God bless whoever first designed the striped sweater! During brunch with some girlfriends this past weekend we were marveling at the perfection of the striped sweater for Fall and Winter. There are so many different types of stripes to love — thinner, thicker, oxford, polo, rugby, mixes, the list goes on and on! A personal favorite of mine is the bateau neck striped sweater. Although Ms. Audrey Hepburn liked her bateau necks mainly in solid colors, I have a feeling that were she alive today she’d reach for the stripes too. I am partial to bateau necklines because they balance out my larger chest well and show off my beautiful collarbones. 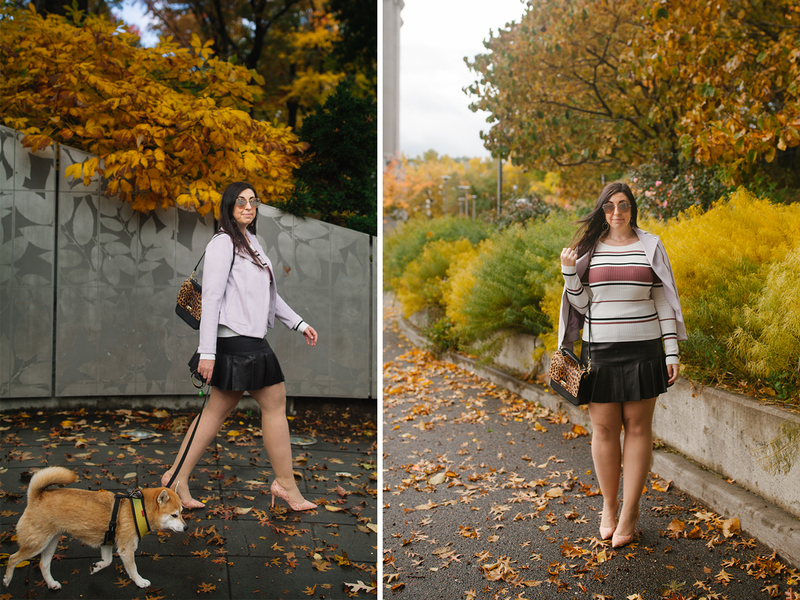 Today I’m showing a couple of ways that I wear bateau sweaters for work. These are both from Express — which has been killing it lately! I’ve found so many great pieces there this Fall for work, weekend, date night, parties (more on that in a post next week!). Right now Express is offering 40% off everything and I highly recommend you take a look! You can see many of my picks in this recent post. 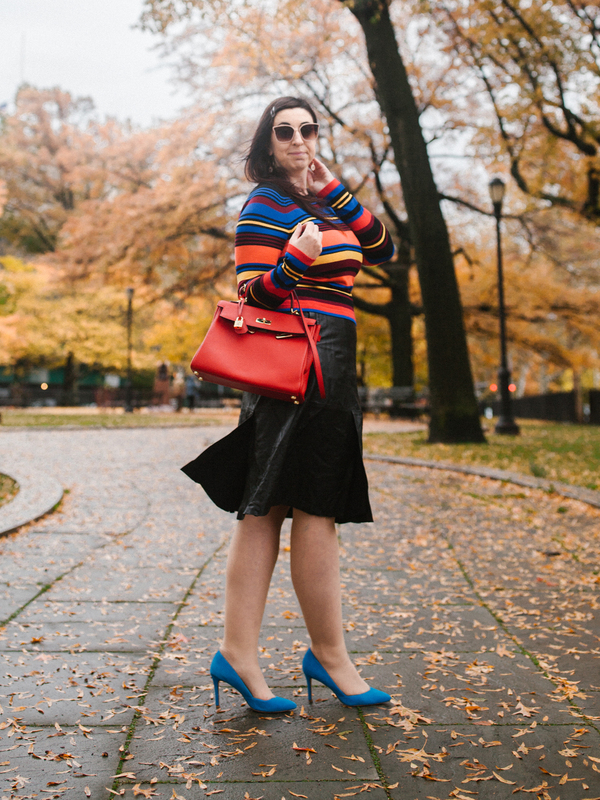 And be sure to follow me on Instagram too, where I’ll be sharing some casual styling ideas for these sweaters and many more striped sweaters over the next few weeks. And since you lovely ladies requested more Cinnamon, here she is! Making her appearance on the way to doggie daycare before I head to work. Express has so many beautiful bateau neck options! I’ll share some of my favorites just below and then after that I have a boutique of striped sweaters. Expect to see plenty more of those here and on my Instagram!! 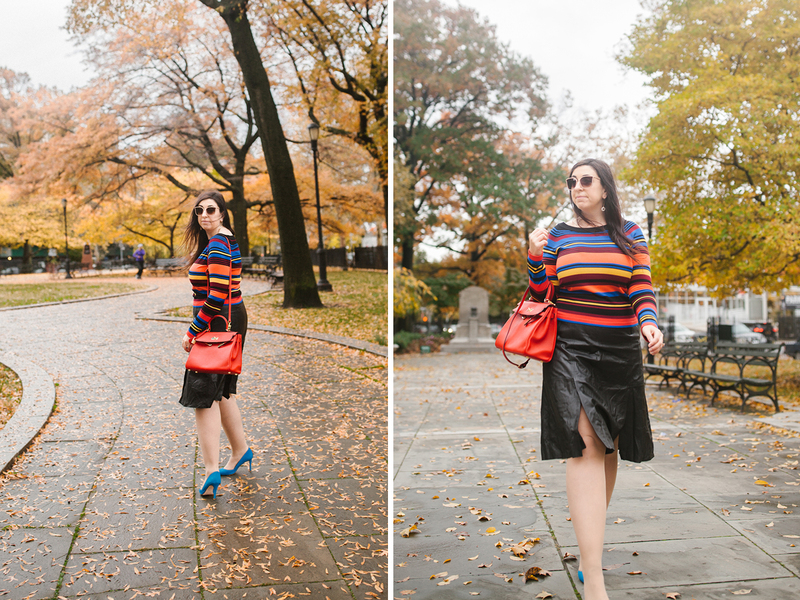 What’s your favorite way to show off the perfection striped sweater for Fall and Winter? Next Post Go to Madewell, get gifts they’ll swoon over!! Can you please explain if I might chance a striped sweater given I am large all over, espec. on top? I am so afraid it will make me look even bigger…if you think its worth a try, why type of stripes/size/etc and a visual would be helpful . Thank you. Hi Nancy, absolutely! Size has nothing to do with what you can wear. It's all about choosing the right style for you. Nordstrom has literally tons of options!! Absolutely in love with both of these outfits!! I've been stalking a similar leather mini skirt and I like how you paired the sweater with it. Great styling ideas! I love your stripe sweater and how you styled it. Very chic!! I love the way you styled those outfits. I was secretly hoping that you'd do an OOTD with the Alpine sweater from anthro because I bought it but am on the fence about keeping it. Oh that's so true MollyBee, I didn't do that on purpose but you're right and I'm so glad you liked it. Yes the Express faux leather is really good!! I love that first shorter skirt, it looks so cute on you! Thanks Jess! I loved this skirt so much I bought it in two sizes, and am very glad to be wearing it on the regular again. That's a good idea, when you love something that looks so good on you…I've done the same with a pair of shoes because I knew once they wear out, that's it and I simply had to have them because not only were they stylish and classic but super comfortable too and I knew I wouldn't find anything like them again. CINNAMON! So great to see her in your OOTD posts Roxy! Love a cute Shiba Inu. You look very cute also — those blue pumps in your second look are amazing and I like both sweaters. Love both of these outfits! 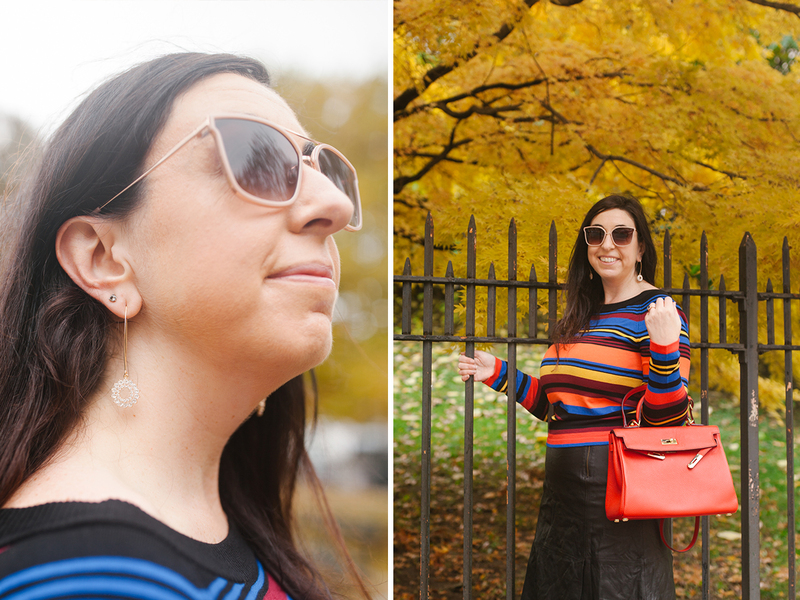 The striped sweater is a must have for fall. Totally agree, and the trendiest pattern may change from year to year but stripes never go out of style. I'm loving the neutral Fall tones in the first sweater! I love me some stripe sweaters! And I'm obsessed with that first look- love the skirt! Aww thanks so very much Marilyn! That first look is definitely my favorite – love the color of the stripes with the leopard bag! They mix together very well! 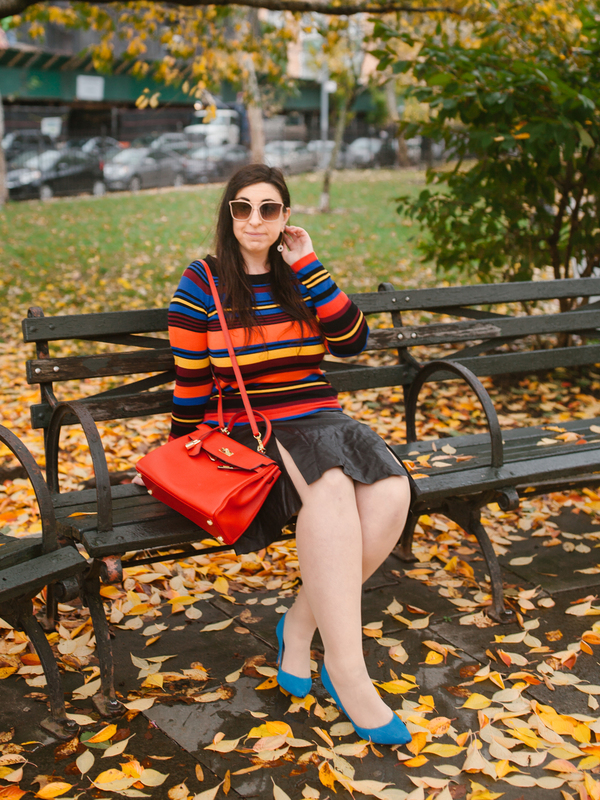 I like to add a touch of color to my outfit with a striped sweater! I love the neutral tones of the first outfit. I love all of these outfits so much. They are all matched so perfectly. I can definitely see myself wearing them. Awwww…..Cinnamon! Both of you are lookin' good!! Yes, stripes are fun! So many great choices this Fall! Stripes joy this time of year as far as I'm concerned!! I am loving all the stripe tops! I love these outfits, the skirts are so fun and playful! Love both looks and glad to see the BR skirt in the rotation!. I now will need to stalk a shorter one. I do like both sweaters and while I have shopped express for pants have not done so for sweaters so will have to stop by during my next shopping trip! Happy Holidays! yes girl! I am obsessed with stripes and all of these are amazing! you look great!